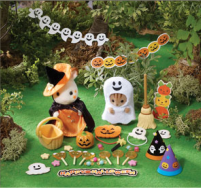 This fantastic new set includes everything your Sylvanian children need to go 'Trick-or-Treating' and even decorate for their own special Halloween party! Rabbit sister Freya Chocolate and squirrel baby brother Ambrose Walnut come dressed in witch and ghost costumes (the ghost costume will fit most standard Sylvanian babies). Also included are sweets and lollipops for 'Trick-or-treating' along with a basket for collecting them in, two masks for other characters to wear whilst 'Trick-or-treating', pumpkin and broomstick, 2 party hats and a huge number of decorations that can be put up for your party. There are even extra decorations that can be pushed out of the packaging once you have opened the box!